Web services have attracted much attention in recent years with the development of e-commercial technologies over the Internet. Although there are some standards and protocols for web service technologies, such as WSDL, UDDI and SOAP, the core technologies underlying Web services need further study in order to make these technologies practical and flexible. Efficient services management is the main task for services execution and services composition and there is no good solution until now. In this paper, we present a concept-based method for services management, which is efficient for services selection and alternative. Our method takes advantage of lattice and retrieves the optimal alternates for a given Web service efficiently by employing formal concept analysis and concept lattice. 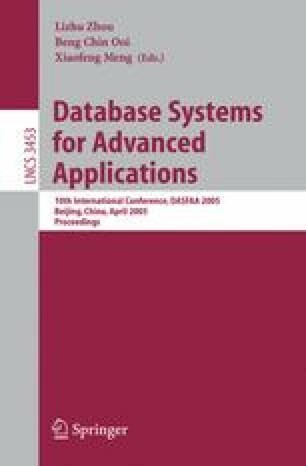 Compared with the former methods, this method is more efficient and accurate because the underlying semantics of Web services and users’ requirements are exploited during the processing of retrieval. Experimental results also verify the efficiency and scalability of our approach. This work is supported by the National Natural Science Foundation of China under Grant No. 60228006, the National Hi-tech R&D Program of China under Grant No. 2002AA116020 and the Youth Foundation of Shanghai Education Committee for Scientific Research under Grand No. 04EC35.